Minnesota can no longer turn a blind eye to the severe teacher shortages and long-term teacher supply issues in the state. A lack of teachers is affecting academic opportunities and achievement in our schools. “While the specific teacher licensure areas experiencing shortage remain the same, the percentage of districts indicating that it is difficult or impossible to hire qualified teachers in these areas is about double that seen in the 2012 survey.” The key shortage areas identified in the report range from physics, chemistry and early childhood to specialists for special education, speech language and behavior disorders. 63% of districts indicate that testing requirements represent barrier to hiring teachers. 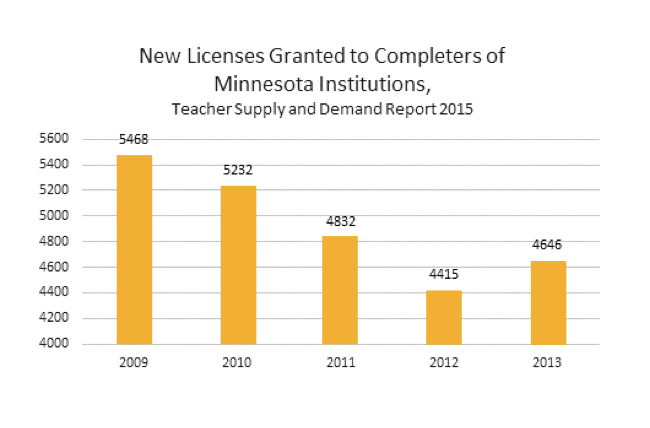 Minnesota granted significantly fewer teaching licenses to graduates of teaching degree programs, falling 27% (1,849 teachers annually) from the early 2000s to today. In the MREA Member Survey in 2014, 22 Northwest Minnesota school districts had 125 professional openings, and reported receiving zero to two applicants for any high school science position or any special education position. In 2015, the Legislature began several small programs, including loan forgiveness, and eased teaching restrictions to help districts hire for hard-to-fill positions. Still, the severe teacher shortages in rural Minnesota mean many districts cannot fill even basic teaching positions. This increases the dependence on variances and long-term substitute teachers. It’s also raising class sizes and leading districts to no longer offer subjects. Offer competitive wage and benefit packages in rural school districts. Continue to provide incentives and support for teachers who choose to teach in subject and/or geographical shortage areas through loan forgiveness and signing bonuses. Continue to develop options for practicing teachers to add additional endorsements. Support mid-career professionals, veterans and educational support professionals to enter the teaching profession. Identify exams and inventories that predict teacher quality and set appropriate cut scores, and discard those that have no predictive value. Reimagine the purpose of the Board of Teaching to include responsibility for teacher supply issues, and restructure it to ensure geographic representation. Initiate a statewide effort to attract teachers.